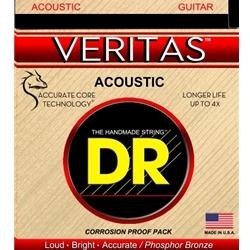 DR Veritas .013-.056 Medium Phosphor Bronze Acoustic guitar strings are great for performers and players needing more life from their strings who aren't fans of many of the coated options on the market. Veritas's Accurate Core Technology (ACT) focuses on the core of the strings, adding more strength and eliminating any variations through the wire. This offers you up to four times more life and improved tuning stability. And the lack of coating avoids the sound differences coating materials can add to your sound. The DR Veritas strings offer longer life from their very core.